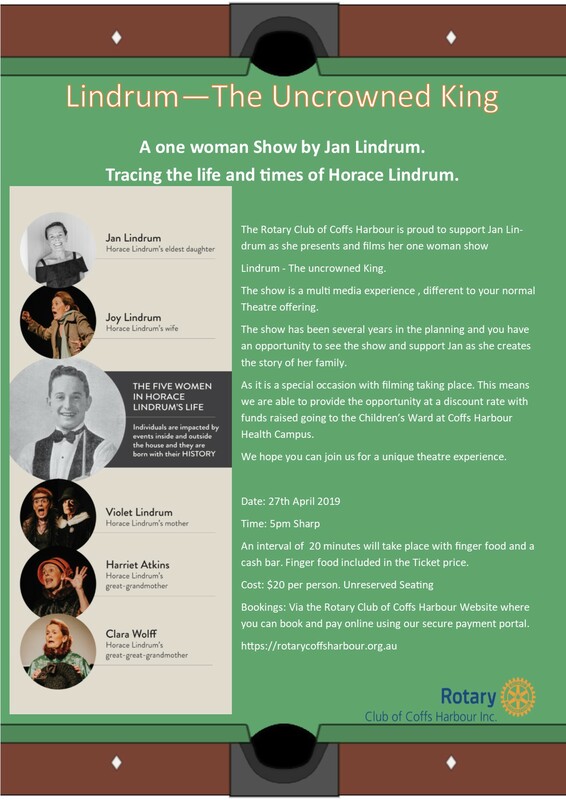 Lindrum - the Uncrowned King is a one woman performance by Jan Lindrum, the Daughter of Horace Lindrum who was a renowned Snooker & Billiards Player and world champion in 1952. The performance uses amongst other things, cutting edge technology to help bring the spoken word to life. The Rotary Club of Coffs Harbour is proud to be involved in the event which will raise funds for the children's ward at the Coffs Harbour Health Campus. Tickets are on a first come first served basis and cost only $20 which includes nibblies at interval. These can be acquired via our secure payment portal. The link is below. The performance is being filmed for future purposes so we are pleased to be able to support Jan in this endeavour as well as raising a little money for the community along the way. With a 5 pm start and a 2 hour performance, why not make a night of it and go out for dinner afterwards?